The fungal infections which often demonstrate this phenomenon include sporotrichosis, pityrosporum folliculitis, zygomycosis, candidiasis, aspergillosis and blastomycosis. It is also seen in bacterial infections such as botryomycosis, nocardiosis and actinomycosis, and parasitic conditions include orbital pythiosis, strongyloidiasis, schistosomiasis and cutaneous larva migrans. In addition, noninfective pathologies such as hypereosinophilic syndrome and allergic conjunctival granulomas have been shown to demonstrate this phenomenon occasionally. The exact nature of the Splendore–Hoeppli reaction is not completely known. However, it has been thought to represent deposition of antigen–antibody complexes and debris from host inflammatory cells. Alternatively, they may represent glycoproteins, lipid and calcium derived from host leukocytes. 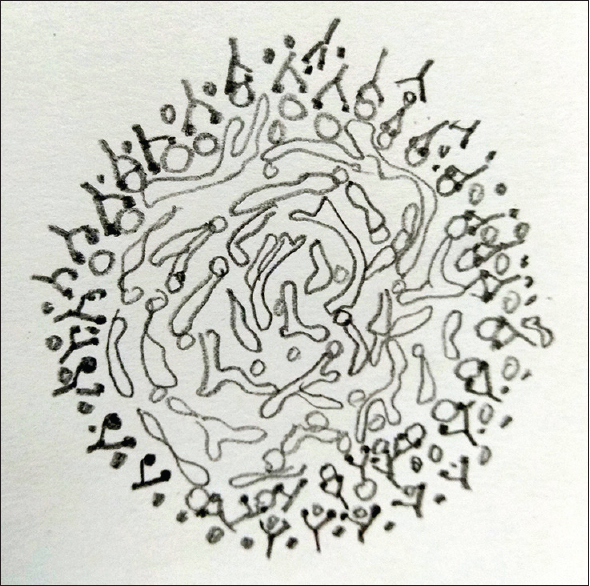 Further studies exploring the mechanism of this phenomenon are needed for the detailed portrayal of this reaction. Differential diagnosis includes flame figures in Well's syndrome, actinomycotic sulfur granules, asteroid bodies in sarcoidosis, tophaceous lesions of gout, perivascular fibrin deposition and keratin granuloma. Flame figures are degranulated eosinophils that form aggregates of granular material which are surrounded by collagen and can also be seen in insect bites and drug eruption., The central branching filaments or diphtheroid forms are not visible in Splendore–Hoeppli reaction and hence this absence assist to make a distinction from true actinomycotic sulfur granules. 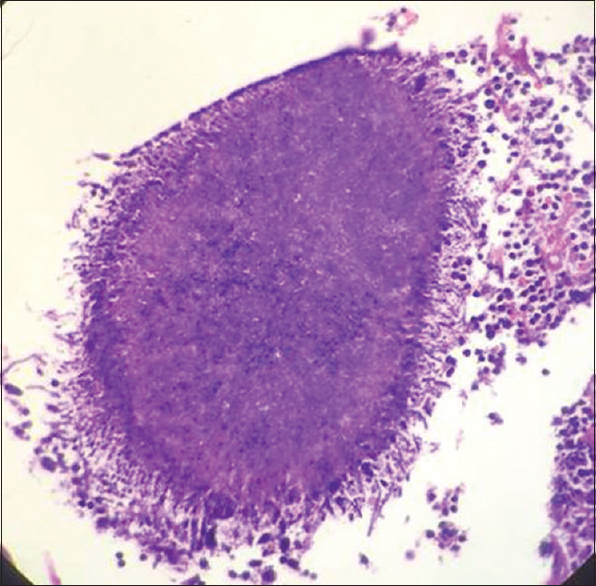 Asteroid bodies are eosinophilic stellate inclusions which are usually seen within the giant cells present in sarcoid granulomas and rarely in other granulomas. Gout granules appear as deposits of amorphous material of varied sizes with parallel clefts and often these crystals have a brownish hue and are double refractile in polarized light. 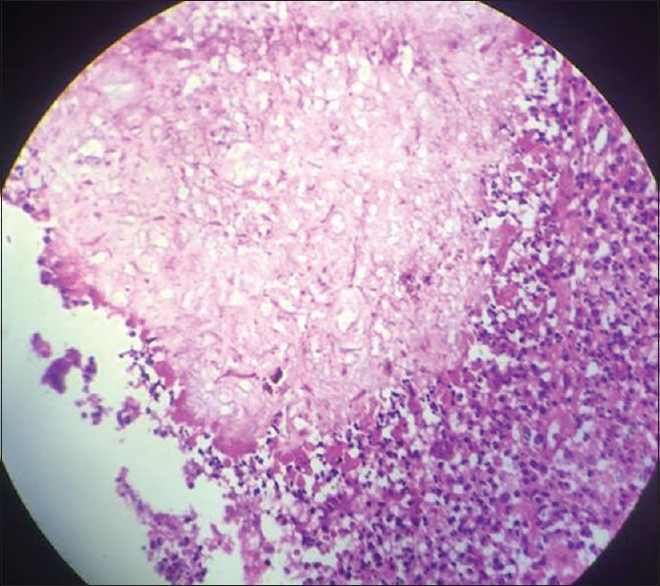 Prompt identification of this reaction can play a significant role in understanding the underlying pathology when the histological presentation is not classic and overlapping conditions can otherwise hinder the diagnosis. Kwangsukstith C, Vanittanakom N, Khanjanasthiti P, Uthammachai C. Cutaneous sporotrichosis in Thailand:First reported case. Mycoses 1990;33:513-7. Liber AF, Choi HS. Splendore-Hoeppli phenomenon about silk sutures in tissue. Arch Pathol 1973;95:217-20. Hussein MR. Mucocutaneous Splendore-Hoeppli phenomenon. J Cutan Pathol 2008;35:979-88. Smith JH, Von Lichtenberg F. The Hoeppli phenomenon in schistosomiasis. II. Histochemistry. Am J Pathol 1967;50:993-1007. Miller RI, Campbell RS. The comparative pathology of equine cutaneous phycomycosis. Vet Pathol 1984;21:325-32. Orhan D, Kiratli H, Kocabeyoǧlu S. Conjunctival Splendore-Hoeppli phenomenon in a 3-year-old child. Pediatr Dev Pathol 2006;9:388-90. Bhagavan BS, Ruffier J, Shinn B. Pseudoactinomycotic radiate granules in the lower female genital tract: Relationship to the Splendore-Hoeppli phenomenon. Hum Pathol 1982;13:898-904. Clinicopathologic conference: Systemic blastomycosis involving genitourinary tract and skin. J Tenn Med Assoc 1973;66:1141-2.